Motor Replacement Type: AC or Sep-ex best for NEV? Which Motor Should "It" Use? First I have a question about a particular OEM EV motor: what did the 1999 Ford Ranger EV have for a motor? And second, I am considering purchasing an NEV that doesn't run, and though it could be the batteries, it might need a new motor. I'm thinking about replacing the motor with something bigger, as I would prefer it could reach the 35 mph speed if possible rather than the 25 mph. From what little I found on them it is supposed to be a 72 volt "sep-ex" or separately excited DC motor that is directly connected via some transaxle. Could you explain NEV "sep-ex" motors of 72 volt variety as I don't see it listed under the motors section? I realize what is listed there is about heavier faster EVs. As you suggest AC for a heavier EV, is there an AC alternative for replacement for sep-ex NEV motors like this 72 DC? Please explain the pros and cons of these motors from EV Drives, too. The EV Drives website shows many types of motors from shunt to series to sep-ex DC motors of various sizes. I see some that are VDC variable from 36 to 72 or 48 to 72 DC. Can you explain what the motors are there that list as VDC but not anything more defined than VDC like sep-ex series or shunt is missing? 1) The 1999 Ford Ranger EV motor was from Siemens. I did an interview with Eric Tischer here about how he put one of these old Ford Ranger motors in his Passat conversion. They're very good full-sized EV motors, way too much beef for your little NEV of course. "Most Common used in Golf Carts....These motors can be more efficient over a wide RPM range than Permanent Magnet and Series Motors but have limited power due to a Constant field Voltage." I don't see them all that often, to tell you the truth, except for these D&D motors in golf carts. I hear they're considerably more efficient than the usual series wound DC motor, so you can use a lighter motor and get the same amount of torque. These HPEVS AC motors come in all sizes from golf cart to minivan. 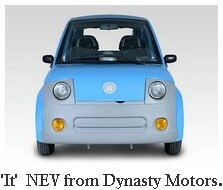 The AC-12 should do the trick for your NEV.
4) The EV Drives motors you linked to look like per-mag DC. I've recently published an article about the lynch motor, which is a type of per-mag DC motor that's pancake shaped - axial flux. What's great about the lynch motors, and I suppose it's true of any permag, is that you can do regenerative braking with them, and they're really efficient compared to series wound. A very light motor. 5) If there's no label after the VDC, I think it's series wound. Not exactly sure, and somebody correct me if I'm wrong, but that's my best guess.